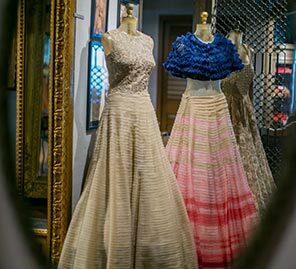 As part of our initiative WeddingSutra On Location, we invited four brides-to-be for a unique experience at designer duo’s Monica & Karishma’s exclusive JADE Couture Studio in Lower Parel, Mumbai. Starting with a Style Consultation, followed by a Makeover and culminating in a professional Photo Shoot, each bride-to-be got an opportunity to interact with some of the best names in Bridal & Wedding services. Here, in the first of the four-part series, bride-to-be Alisha Murpani writes about her experience with WeddingSutra on Location at the JADE Studio. “Every girl has dreams of a fairytale wedding and once I got engaged I began to research weddings. I came across WeddingSutra and fell in love with the way they detail every nuance and need for the perfect wedding. My excitement knew no bounds when I received a call from them informing me that I’d been shortlisted for WeddingSutra on Location at JADE by Karishma & Monica. JADE Studio located in one of the Lower Parel's highrises is a one-stop solution for all bridal needs. The store houses clothing, footwear and gifting items. The floor to ceiling windows and the vintage decor is impeccable. The lehengas are breathtaking and beautifully arranged to create an arc of gradient colour… ivories and golds blending into the warmth of reds, oranges, pinks and slowly turning into cool blues on the other end of the display! I came across a chic carnation pink cocktail gown from 'The Temples of India' collection that was so beautiful. Team WeddingSutra insisted I try it on and it was gorgeous, intricate sequin embroidery all over, so comfortable… I loved the way it looked on me! Next, I met Ojas Rajani for makeup and hair. Ojas can really transform a Bride into a Goddess. She decided to give me a glam look, defining my eyes and creating voluminous curls for my hair. After the makeover I discovered a new me. It was now time for Lights, Camera and Action with Ace Wedding Photographer Shreya Sen. Super active, Shreya guided the poses, the smile and rehearsed with me the facial expressions a bride needs to have amazing pictures on her special day. Ojas decided to enhance Alisha's subtle and soft features with a chic makeover. Ojas began by creating a base with the feather light Lakmé Absolute Mattreal Skin Natural Mousse in Ivory Fair on her face and eyes. She then set the base with the Lakmé Absolute White Intense Wet and Dry Compact in Ivory Fair. Ojas decided to use the newest strobing technique focusing exclusively on the highlighter. 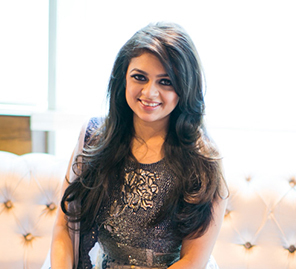 She used the Lakmé Absolute Moonlit Highlighter to achieve the luminous glow on her cheeks. To glam up Alisha’s eyes, Ojas applied the Lakmé Absolute Eye Chromatic Baked Shadow in Night Desire and used the Lakmé Absolute Kohl Ultimate to give a winged out smokey look perfect for a cocktail ceremony. She then added a few coats of the Lakmé Absolute Flutter Secrets Dramatic Eyes Mascara to her lashes. For her lips, Ojas used a subtle shade of Pink Caress from the newest range of Lakmé Absolute Scult Studio Hi Definition Matte Lipstick. Finally Alisha's hair was styled with tight curls at the ends with a little teasing on her crown.